Hey What’s going on guys..In this video you are going to see 10 Simple Ways to Make Money Online The internet can be a place where you can make a few extra dollars, but with so many articles on how to make money on the internet, get cash fast online and make money online fast are leaving us all a bit breathless and confused. Unfortunately, yes, there are many sales pitch articles that want to entice you to purchase a trial program which is often backed by a 45-minute long video showing expensive cars, swimming pools, exotic holiday locations and wads of cash to go with some annoying narration from a guy promising “wealth beyond your wildest dreams”. 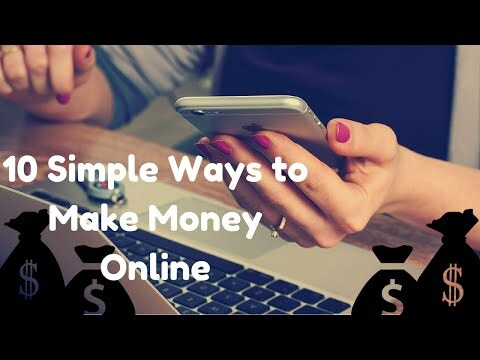 You should not waste your time with these, so without any further ado, here are the 10 simple ways to make money online. Blog – blogging is easily achieved and making money on a blog can be a little perplexing. You need traffic to your blog and affiliate sales. Discipline and patience is needed but for those who get it right, there are huge sums of money to be made from this niche Amazon – sell your unwanted stuff on Amazon and you could rake in thousands in less than two years. eBay – open a PayPal account and get selling all your unwanted children’s clothing, books, CDs and any other bric-a-brac and you’ll see your sales balance build up nicely in no time at all • Foap–Foap is an app available on both Android and the iOS devices where users can sell their photos. Folk are always desperate to find a good photo to use for work or some journalistic piece, and you can charge whatever you want for your image, so making money online via this app is limitless. Field Agent – is another app where you can do small jobs at a local store for easy cash. Simply look for jobs in your local area and carry out the instruction and get paid. Slice the Pie – Listen to a piece of music for just 90 seconds and review it by typing a short paragraph and you can make money for listening to great new sounds. Online Surveys – there are several sites that will pay you if you fill out an online survey. Some will pay up to $per survey and each one takes less than 10 minutes to complete. Unique Rewards – a click on an ad website where you get paid for clicking on an ad. There are many more like this including Swagbucks and Inbox Dollars. Etsy – a selling site similar to eBay but designed to be cheaper and easier to operate for sellers. Fiverr – perform micro-jobs for a $5 fee or work by the hour. These are real money making websites that won’t charge you cash for joining and with a bit of time and dedication will make you money online fast. So guys hope this 10 Simple Ways to Make Money Online way gonna really really help you to success and step by step if you follow you can earn more money in a short time.